Summary: Planting cover crops is currently one of the most popular topics in U.S. agriculture, but identifying how to manage cover crops to maximize their benefits is critical in planting both single species and cover crop mixtures. This presentation will help consultants, growers, and other practitioners in the Southeast to understand how management can affect cover crop performance and to recognize the costs associated with crop management practices. 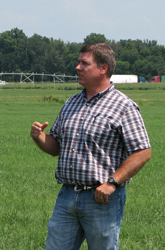 Specifically, practitioners will learn the following from this presentation: why cover crops are beneficial for soils across the Southeast; how the plant date affects biomass production; what advantages and disadvantages result from different planting methods; whether a cover crop should be fertilized; and what factors to consider for termination. Cotton yield results, as they relate to cover crop mixture performance, will also be presented.